The United States is increasingly becoming dollarized. That’s because, for decades now, those at the bottom have been left behind, forced to attempt to get by in ever more precarious conditions. While that kind of dollarization comes up in the context of macroeconomic crises, generated by volatile capital flows and other economic shocks beyond the control of traditional monetary authorities, the dollarization I’m referring to here stems from a very different kind of crisis, one that is happening inside the United States. 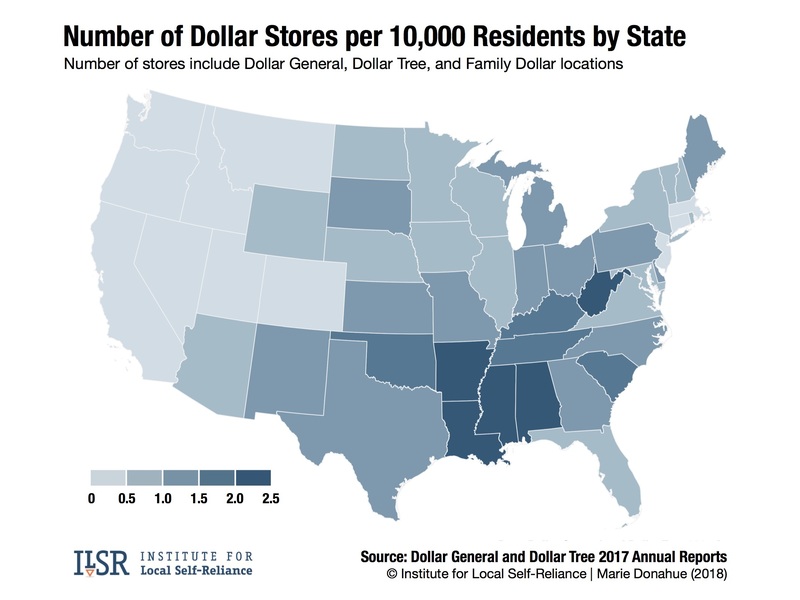 According to a new report by the Institute for Local Self-Reliance, the United States now has more dollar stores—including Dollar General, Dollar Tree, and Family Dollar—than Walmart and McDonalds locations combined. Alongside aisles lined with clothing and household goods, these small stores offer a narrow selection of processed foods, such as canned peaches and cereal, cookies and frozen waffles. There are no fresh vegetables, fruits, or meats in most dollar stores. 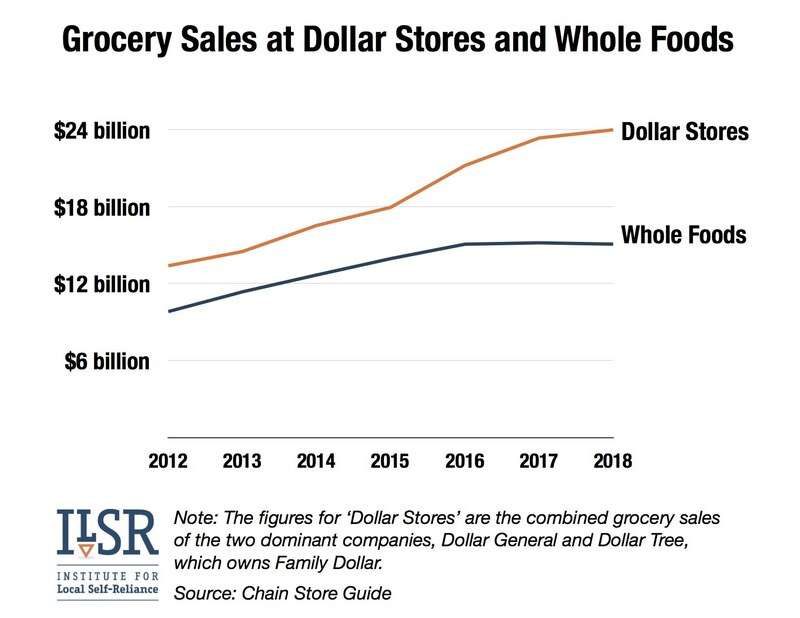 And yet, as limited as their offerings are, dollar stores are now feeding more Americans than Whole Foods is, and they’re multiplying rapidly. The fact is, both groups of food retailers have grown rapidly in recent years. As of September 2017, Whole Foods operated 470 stores, with 448 stores in 42 states and the District of Columbia (and an additional 13 stores in Canada and 9 in the United Kingdom), up from 275 in 2008—mirroring the rising share of income going to the top 10 percent (the red line in the chart at the top of the post). Dollar stores have grown even more rapidly: Dollar General alone went from 8,362 stores in 2008 to 14,534 in 2017. 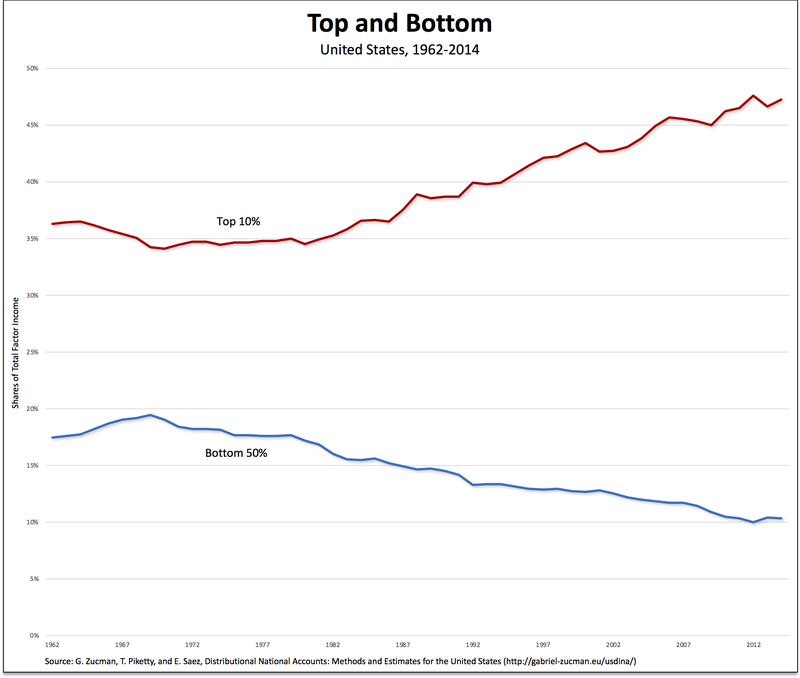 That dollarization of the U.S. economy is both a condition and consequence of the relative impoverishment of the bottom 50 percent of Americans, whose share of income (the blue line in the chart) has fallen from 19.4 percent in 1969 to 10.3 percent in 2014 (the last year for which data are available). As the authors of the report explain, dollar stores are both a symptom of larger economic trends and a cause of additional economic despair. On one hand, they move into impoverished, low-income neighborhoods that have few if any other retail merchants and grocers. Essentially what the dollar stores are betting on in a large way is that we are going to have a permanent underclass in America. It’s based on the concept that the jobs went away, and the jobs are never coming back, and that things aren’t going to get better in any of these places. That, unfortunately, is what dollarization means in the United States today. *“Amazon did not just buy Whole Foods grocery stores. It bought 431 upper-income, prime-location distribution nodes for everything it does,” tweeted Dennis Berman, the Wall Street Journal’s financial editor.